Everyone has been there at one time in their life or another when they wish that they had the knowledge to fix their air conditioning or heater. Just the very thought about having to pay someone to fix it makes one want to learn how it is done. For others, their desire is to be able to fix refrigeration appliances or be able help others with their heating and cooling needs. 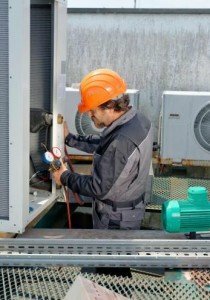 Here are some things that you will need to about becoming an Air Conditioning, Refrigeration and Heater Mechanic. While you are still in school take the time to and take classes that deal with chemistry, mathematics, mechanical drawing, ways to read blueprints and other classes that deal with computer read outs. Graduate high school or finish a GED program. You will need to finish your basic schooling in order to move into this career choice. Enroll in a trade school or take classes at a local community college. The school you choose will need to classes that deal with HVAC systems and refrigeration devices. Classes can take up to two years to complete. Make sure to map out your course path so you know the time frame it will take to complete your education. You will also want to get hired on as an apprentice so you can learn the rest of your education that your schooling does not teach you. An apprenticeship can last up to five years and will include hands on training while you are being paid. Most students usually know a person that they can work with. If you find yourself in a position that you need help finding someone to train with, then check with you school to see if they have a placement office. Depending on the state in which you will be working you may need to get a license in order to work on selected units. Check out your states local website for more information about what you need to do to get a license. Get your EPA certification so you can handle the coolant needed in most refrigeration devices. You may have to take the test at an EPA school. You will also need to specify what type of certification you need to work on certain appliances. As a heating, air conditioning and Refrigeration mechanic you can expect certain things from your new position. You can expect a median pay of $42,530 per year with an average of $20.45 per hour. Your pay per year depends greatly on the amount of work you schedule allows you to complete. Job training is done while working and can take several years to complete depending on which path you choose for education. You can expect serious job growth at a 34 percent per year growth pattern which is faster than most other job professions. It is expected that there will be an additional 90,300 jobs added over the next 20 years. Your work environment can include places like homes, office complexes, factories and any other buildings that have these units installed. Sometimes the places that you will work will be cramped but your hours will be enough to keep you busy. Expect to have to renew your license every couple of years based on the laws of your state. Based on the increase in jobs over the next year you can expect work to continue to grow so there will be plenty of it year round.